Herve looking out of the window of the miniature steam train to Ooty. The Nilgiris were good sized hills, they rolled out into green carpets and then pinched into dark wooded valleys. The peaks were covered in scrub; the sides were dotted with water buffalo, who kept the grass mowed like a lawn. The wooded gullies were called sholas. Don Oberdorfer had pointed them out to me the week before from a vantage point in Kodaikanal. "When I was a kid we used to camp down in sholas like that one," Don had told me. "There would be panthers, tigers, all kinds of wildlife. Now, with all the people moving in around here, I don't think there's much around Kodaikanal, you'd have to go further away to find it." The particular shola that Don was pointing to was sloped at about forty degrees and was particularly steep, and had very clearly defined borders. The trees that made up the forest could only survive within the shelter of the surrounding hills. Don went to the Kodaikanal International School from the time he was five years old; I never asked him his age, but certainly part, if not all, of his childhood would have been before the Partition in 1947, when tourists did not visit Kodaikanal and life was more colorful. As we were still looking at the same shola, he told me another story. "I went out hunting for this elephant that had killed a few villagers, with two of the Maharaja's sons; they were educated in Britain, very smart men, but this sort of old-world things like elephant hunting was still a skill that they learned from the time they were young. Men beating drums would start at the top of the sholas, beating drums, and the Maharaja's sons both started at the bottom, carrying these huge .50 caliber elephant rifles. The elephant burst out of the forest above us. I ran out of the way, but the Maharaja's son who was there shot it, and it was like the elephant hit a wall." 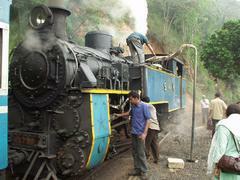 The locomotive of the Ooty miniature train. 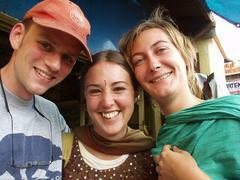 My companions in the Nilgiri hills around Ooty were all French women, and Rajiv, who was our overconfident guide. Rajiv walked with a swagger, left an extra button unbuttoned on his shirt, and was tall for an Indian - almost six feet. He seemed like he would belong in an Indian production of Saturday Night Fever. There were no elephants in the area where we were walking, so we woudn't have an experience quite like Don's, but there were panthers and tigers, according to Rajiv; he had seen two in the last few weeks. "One was pretty far away, but the other was only about where that 'Police' sign is," he said, pointing to a place less than a hundred feet away. I kept my telephoto lens on my camera and my shutter-release finger at the ready, but we, unfortunately, did not see any striped cats. 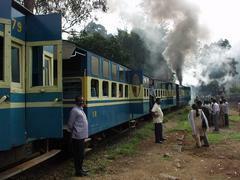 People waiting outside of the Ooty train at a watering stop. different. I've looked it up on the Internet and it's still kind of confusing; not much in the way of information exists in English and I don't have the patience to slog through the French. It involves psychology, posture and movement, and it is very French: those are all the firm facts. The day before I had gone hiking in the same hills with Rajiv, Angelique and Céline, and now the four of us were going to stay overnight in a village of the Toda people, the predominant tribe in this section of the Nilgiris; Fabienne and Veronique were just in for a day hike. We were joined by two other "guides", a pair of Indians who we werent paying that were tagging along. 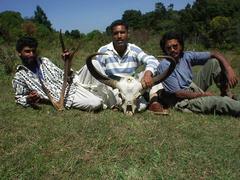 Subbu was a short, bespectacled Tamil with long hair, who worked as a guide in a nearby game park. 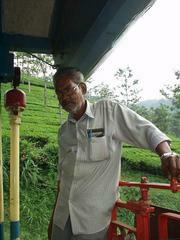 He was interested in learning about other areas around Ooty than just the one corner where he usually worked. Since his regular job involved dealing with animals a great deal, he was a useful addition; every half an hour he would stop, hush us, and listen carefully to a tweet or twitter, and then utter his identification: a flycatcher, a bulbul. In contrast, Rajiv was generally clueless on wildlife and plants; fortunately he was good at not getting lost, which was his primary task as our guide. The other two women, Fabienne and Veronique, were joining us just for part of the day. We hiked up hills and down, through tea plantations and a small village, where another somber-looking Indian joined us, and subsequently did not utter a word. Rajiv was quick to point out the areas where the sholas ended, and faded into low clipped grass. "Here there are many microclimates, you see how here it is grassland, natural grass. It is short because there are many buffalo, and they keep it short. It is not possible to re-create this, since it is not man-made. It is protected by the government." He went on to explain that the government protected it by making it illegal for the Todas to sell any of their land; the British had issued a fiat to that effect in about 1890, and the Indian Government had kept up the tradition. Priya, a Toda woman, preparing dinner in her village in the Nilgiri hills near Kothagiri. 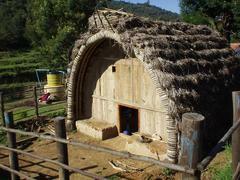 At one glade, there was a man playing a snake-charmers flute in front of a small thatched hut. The hut was called a patty, a temporary dwelling that the Toda used for overnight stays and for shelter when they were out herding their buffalo. After another climb on a steep wooded trail, we reached the Toda village where we were going to stay, named Bikkapathymund, and there we left our packs. We briefly glanced into the kitchen, where there was a stove low against the ground and a large assortment of tin pots, plates, and cups racked on the adjoining wall. We paused for twenty minutes to catch our breath and drink some tea, but Rajiv wanted to reach a nearby peak, with a temple, for sunset. A girl of about twelve who lived in Bikkapathymund joined us on a hike up a steep ridge. Her name was Sheela; she was vibrant, pretty, and, although usually outgoing, occasionally taken with fits of shyness. She wore her blue and white school uniform, and walked barefoot. This was mind-boggling: many of the rocky surfaces that we traversed looked like they had many sharp points and edges, but Sheela didnt complain, or even look like she was suffering in the slightest. She and Céline almost immediately took a liking to each other, which would continue to be a theme with Céline. Where I got tired of refusing beggars, trinket-sellers, and shoe-shiners (did my hiking shoes really look like they would benefit from a polishing?) all the time, and so ignored them, Céline would refuse them politely, and sometimes - particularly if they were children - engage them in as much of an Enlish coversation as the two of them could manage. We reached the summit. The temple was whitewashed and had blue-skinned gods and godesses in a frieze around the whole upper part of the building. A small hut was nearby, and banana leaves lay rotting beneath it, having probably been used to carry up a food offering to the god. When we got to it, however, the entire complex was deserted, and the view around us was more spectacular than the temple. Rajiv pointed out the village we had passed through previously; it was tiny, as if were were looking at it from an airplane. We sat on the edge of a stone wall nearby and contemplated the view. Sheela had brought her Tamil book, with English translations, and she was trying to teach Céline some Tamil words at breakneck speed. For a third of the words, Céline would turn to me and ask for the French translation of the English word for which Sheela was trying to teach the Tamil word. Sheela started with the parts of the body section, barking each Tamil word, and Céline would repeat it back, occasionally turning to me and saying, "showl-dair?" or "elbaouw? ", and I would tell her the French equivalent or just point to my shoulder, elbow, or whatever. Sheela, of course, could have performed the gesturing service, but she was usually too enthused about uttering the next word to care whether her student had understood the last. 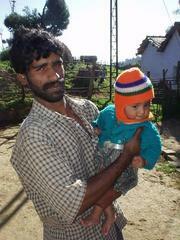 Toda man and his daughter, Nilgiri Hills. Rajiv butted in. "How are you feeling this moment, eh? I think you will Perhaps remember this for a long time!" Angelique, Céline and I turned and looked at him, and then turned back to sight of the sun setting behind the ridgeline. It was, in fact, an impressive sight, but it only diminished it for Rajiv to try to market it as such. Soon Rajiv, the silent Indian, Fabienne and Veronique started to hike back down the ridge towards the first village. Presumably, this was the reason the quiet man had joined us, was to guide them back to that town, from which they could catch a bus back to Ooty. Being both French and a traveller, it was not surprising that Céline smoked like a chimney, and Angelique only slighly less so. I took them up on their offer of a Gold Flake cigarrette, and we sat there puffing away, watching them fade out into nothingness along the ridgeline in front of us, where they were backlit by the dying sun. After safely sending Veronique and Fabienne on their way back to Ooty, Rajiv walked back up the ridge and then brought us back down to Bikkapathymund. The Toda village was almost too small to call it a village; it was perhaps instead a settlement or a homestead. Home in the hills: a traditional Toda house, a Warthetyas or Perzilas. The elder of the community was named Onihr Katan. Although he was over sixty, he was quite spry, with longish hair with a few streaks of gray that curled up into a small afro that glistened with coconut oil -- some of which he offered me at one point in the evening in a tin bucket, if I wanted to coiffe my own 'fro (I passed). He smoked bidis with the professional flair of a lifetime smoker, keeping them tucked into the palm of his hand, which he would invert every minute or so for a deep drag. He seemed very happy to have us, and frequently asked us interested questions about our homes. These were uttered in what seeemed like a melange of English and Tamil, although previous experience had taught me that people in India could speak English in such a way as to make it equally incomprehensible to me as their native tongues. Sometimes I could figure out his intent; other times I had to lean on Subbu or Rajiv to translate, if they were present. There was one main building with the kitchen and residential rooms on either side, another building with two rooms for sleeping and a recently-installed television that was showing a cricket game, and two traditional dwellings, which they said could be called either warthetyas or perzilas. These last looked like oblong wigwams, with arches at either end that supported poles running the length of the house; several inches of thatch were put on top. Priya, the eldest of the three girls present, who were all Onihr Katan's granddaugters, cooked us dinner on the low stove. There was an area underneath it for the fire, into which she put the end of two five-foot long, two-inch thick pieces of wood; as the end burned to ash, she pushed more in. We were served a small serving of oopooma, which was exactly the same as couscous except spicier. While we muched on this, Sheela and her younger sister Shagila showed us the family pictures, of which there were quite a number. Their great-grandmother and her sister stared out of the old black and white photographs with blank, serious faces, and they had their hair curled into spiraling coils, like the side-locks of Hasidic Jews. There were some pictures from Europeans who had also stayed here and written back, enclosing their pictures. And there was one of what we were told was a Toda wedding ceremony. There were many people dancing, but the bride was not one of them: she was seven months pregnant. Céline was very intrigued by this, and asked Onihr Katan how marriage worked, with Subbu acting as translator. "He says that the wedding only happens after the woman is seven months pregnant with the first child." How was that possible, wondered Céline? Did they just start having a sexual relationship out of the blue? Surely there must be some ceremony at the beginning of those seven months? Céline had some trouble getting that out in English; so she told me in French, I translated to Subbu, who in turn converted it to Tamil for Onihr Katan. Surprisingly, not much seemed to get lost; the answer that came back made sense for the question she had asked. "He says that there is no ceremony. The man shows up at the home of the woman and asks her if she wants to live with him, and if she does, then she goes with him." What if there is no child? L to R: one of the Toda men, Rajiv, and Subbu. "Then there is no marriage," said Subbu, after the requisite translations. "In the past that used to be very bad for the woman, and the man would find another woman to be his wife. But now people are more into romantic marriages and love, so it is not so much of a problem. Usually they will stay married even if there are no children." Food came; unlike the oopooma, this was more usual Indian fare: rice, vegetable curry, and chapatis, which are round pieces of bread. The closest equivalent in a Western grocery store is probably pita bread, but this was from coarser flour, and hot off the grill. As we ate, Priya continued to make more chapathis for us. Eating in the traditional manner, particularly in southern India where more rice is used, is like preparation for a food fight. Curries and rice are served separately in tin bowls, on either a tin plate or a banana leaf. You then take the rice and some curry and mix it together with your right hand. I usually did this with just my fingers, but when I watched other people in restaurants, they usually mixed with more fervor; the older they were the more enthusiastic they became. The elderly grandfathers in a typical "Pure Veg Hotel" (which translates from the Hinglish to "Traditional Vegetarian Restaurant") can be seen mashing their rice and curry with their whole hand, picking it up handfuls and squeezing it out though their fingers. This proceeds for up to a minute, and then they pick up a small handful and, just as I was about to imagine that they were going to fling it at their old-time buddy across the table, they deftly stick it in their mouth. "In your country, it would be strange to eat with your hands, right?" asked Rajiv. Goodbye picture with the French women, take two. We acknowledged that it would, in fact, draw stares in most restaurants. "Here it would also be strange if I asked for a spoon. But I think that it is maybe better that you eat with a spoon. With your hands you are eating too fast. But that is just my own analyze." We stayed in the warthetya. Rajiv, now clad in a traditional lunghi, offered to build a fire for warmth, as the warthetya had ad fireplace like the one that Priya had been cooking with. I was the only one of the three of us with a sleeping bag; Angelique and Céline assented. After ten minutes of fiddling with kindling and the five-foot long fuel branches, he had a small glowing blaze going, but by that time the three of us who were planning on sleeping inside the tent had been forced out, eyes red and coughing. "No problem, smoke goes right through the roof," said Rajiv. "You wait a few minutes, no problem." 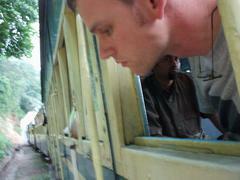 The brakeman on the last car of the Ooty train, on the way down. We waited a few minutes and then crawled through the low entrance. It was still a problem. I was sleeping on the floor, and the French women were on a sleeping platform a few feet off of the floor. I was the closest to the stove, but my lower placement made for less smoke -- and it still made my eyes burn. "Maybe you should put the fire out," said Angelique. I put the fire out as best I could, pulling the two main sticks that were burning out of the stove. They still smouldered. "Maybe you should put the fire outside," said Céline. Me again, and you can see Krishnam behind me. I gingerly lifted the two branches and shoved them through the door, where they smoked and sputtered little showers of sparks on the ground. The next morning we ate breakfast with the family, and the children dressed up well for school and packed off with loads of books; education is a big priority in the south of India, and particularly in Tamil Nadu and Kerala. Onihr Katan came in to the kitchen, evidently fresh from washing, re-oiled his hair, and then prayed for a minute in front of an icon of Sai Baba. Sai Baba is a Hindu guru, and he has an afro that makes his head into a three-foot diameter globe. I wondered if he had any effect on Onihr Katan's hairstyling. We hiked back down, which was not terribly different from the way up; there were tea plantations, which looked more scraggly than the ones around Munnar. Rajiv exhorted us to drink the local water (we used iodine tablets instead), to carry my backpack (I declined), and asked us at different times to recommend him to Lonely Planet and to leave written testimonials (we didn't). He wasn't a bad guide -- he didn't get lost -- but he was a little overbearing. The bus ride back was hair raising as usual, swerving back and forth around the hairpin switchbacks on the way back to Ooty. "It's amazing how you get used to the bus rides," I said. "I used to be quite scared the first time I was on one." "The important thing is not to look," said Angelique. "At first Céline would sometimes grab my arm when we stopped or turned fast, but now that we've learned to trust them and not to see exactly where they are going, it's fine." I took the same toy train back down. I bought a first-class ticket, but then while I was no the platform started talking to a pair of attrative women, one each from Australia and New Zealand. They went to second-class; I followed them. When I travelled the year previously in Turkey and the Middle East, there had been loads of Australians; sometimes half of the people in the guesthouses I was in were from Australia. But that was not the case in India; they were only the second group of Australians I had encoutered in four weeks. The ones in Turkey had come to visit Gallipoli on Anzac Day, commemorating the botched landing in the First World War that had resulted in massive Austrialian and New Zealand casualties; it was the first time that the happy-go-lucky new nation had really felt the pain of warfare, and so became the Australian equivalent of American Veteran's day. These Anzac day backpackers were almost all based in the UK on the the two-year work visas granted to them by the British Government, since the conversion for the Pound Sterling was much better than the Australian Dollar. I mentioned all this to Cindy, the Australian. "Yeah, there are loads of Australians there in Turkey, I know lots of people that have gone for ANZAC day. Sometimes when I was in Europe people would ask me, 'Are there any people between twenty-five and thirty years old left in your country?' They estimate that there are more than 10% of us that are gone at any time." She didn't say whether the statistic was for the age bracket she mentioned or all Australians, and I didn't press the subject. Cindy had been travelling for three years and had worked for a while in Seattle. I asked her if she had visited San Francisco; yes, it was a fabulous city! But when I pressed her for details of why she like the city, she just elaborated on what an inexpensive place she had found to stay. At this point the conductor came and checked tickets; we were in the "Reserved" cabin, which involved paying an inexplicable reservation charge of fifteen rupees. The women moved forward two cabins to Unreserved; I chose to use my first-class ticket and went to the very back of the train, the last section of the last car, where I had a 270 degree view of our descent from the hills. 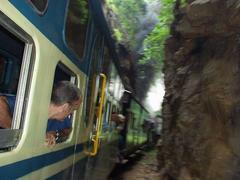 First class turned out to be a wise choice for my health when we reached Conoor. In reverse of the process of going up into the hills, the engine was changed, from a modern diesel to the coal-burning choo-choo. The bellowing trumpet sound of the diesel became a shrill steam whistle, and the train lurched with the now familiar da-da-da-da-daaaah. The engine was always on the downhill side; so now, on the downhill journey, the passenger cars were engulfed in the massive plume of coal exhaust that the engine belched out. First class, being the last car, was for the most part spared. Later, I asked Cindy about how Unreserved went on the other end. "Yeah, it was pretty bad. It was bad enough from the smell, but then I started to think, 'I'm starting to feel kind of tired,' and when I looked around I saw that most of the poeple in the car were sleeping or nodding off." All of the people in first-class were Indians, either professional-looking men or married couples. Behind me there was a man, who seemed to be well-dressed for a railway worker, standing on a small platform behind our compartment. He had two heavy handles, one on either side, that he spun up or down every few minutes. When they went down there was a loud wailing screech; it was obviously a brake of some kind, but I couldn't tell how it worked: Why were there two? Was he steering? How did he know when to apply them? Was he the brakeman for the whole train? There was also a third, heavily serrated rail in between the two, the purpose of which was not clear. The windows were open, so I was able to speak to him; he was only a few feet away. When he seemed unoccupied (it's best not to distract a driver of a car, let alone a train) I asked him about the handles. Unfortunately, he spoke the same blur of Tamil and English as Onihr Katan. "Hand braka for dowgradma," he replied. "Do you use only one side at a time?" "No. Togetwa, for tenkilometrie sa ba." I gave up. I basically understood what he meant, but more complicated questions seemed like they would yield totally ambiguous answers. After a few minutes, the man across from me, who was about my age, wearing trendy clothing, and travelling with his wife, leaned across me and chatted with the brakeman for a little while. After he had finished, I asked him about his name and job, and then about what he had asked the brakeman. His name was Krishnam. He was from Madras, worked as "an IT guy", and he spoke English as if his IT guy job involved lengthy discussions with people from San Fernando Valley. "He was saying that this is like a brake system that they only use for a little while like until we get to Mettupayalam. Because the engine is like a hundred years old or something and it can't keep the main train in control like all by itself. The one lever" -- he pointed to a yellow one with orange handles -- "is for the chain, you can see there is like a chain track in the middle. This car has like a chain running underneath it and that is like attached to the track, and that is slowing down the train. He said there is a man like him at each car, and so I asked him about what about being in sync, is it not like coming apart if they apply at different times, and he said it was just like because of their training that they do it together. The other handle is for the wheel brake. I also asked him about those tubes" -- pointing to one of two tubes that ran up the two outside rear corners of the car -- "and he said it was vacuum brake, like for emergencies." The two primary types of destinations that Indian tourists visit are temples and waterfalls. Krishnam's wife was no exception: although normally very quiet and docile, she would crane her neck out the window and gawk every time a waterfall went past, which was fairly frequently, since it had been raining heavily in the preceding week. At the Hillgrove station, one of the stops for watering the engine, he suggested that I get out and read a plaque to learn more about "the calamity". The plaque was, appropriately, titled "History of the Calamity", and it descrived how half a kilometer of track had been wiped out in a mudslide, and had taken sixteen lakh rupees -- Indians count large numbers in "lakhs" and "crores", which are a hundred thousand and ten million respectively -- to repair. When I got back on the train, Krishnam mentioned that the train had not been running the week previously because of the rains; I was apparently quite lucky to be able to ride it both to Ooty and back. I bought a ticket first at Mettupayalam to Coimbatore, which was again only two hard-bench second class bogies; Cindy and her Kiwi friend, whose name I now forget, joined me. I said that I wanted an ale, since all of the Indian beers were lagers that tasted like Heineken. This started a torrent of longing for foods of the South Pacific. Cindy missed Vegemite, and the Kiwi missed Marmite (which is the New Zealand equivalent of Vegemite); they both missed Milo, which is a type of Australian hot chocolate. Mercifully, I had never experienced any of these foods, so I did not suffer from their same pangs of longing. We made it to Coimbatore. It had been mostly empty coming down from the hills, and we were sitting in second class, which was unreserved: if you or one of your posessions could occupy a seat, it was yours. Coimbatore was the first big city on the train's line; a crowd broke upon the side of the train, and people started flinging handkerchiefs, bags, hats and other items through the bars over the windows and then began elbowing their way through the door to try to find the seats where they had landed. It was quite a sight. I had previously been considering staying for the entire ride in second class, but I abandoned those immediately; the three of us shoved our way out of the car against the incoming tide; I bid farewell to the two women, found the conductor, and purchased a ticket for an air-con car for a more comfortable night of sleep on the way to Chennai.